Enjoy the convenience of an online health profile and the instant communication of a custom-engraved medical ID with the HudsonTech Med ID. Featuring an adjustable leather band with watch-style closure and an affixed, hypoallergenic ID tag, Hudson is a unisex style that’s easy to put on and comfortable to wear. Every Hudson Tech ID includes a secure MyID online health profile account, which first responders can access via QR code, website, or 24-hour call center. These access points and your user ID and PIN are engraved on the back of the tag, and your MyID service is included with your purchase. The front of the tag bears a bold red caduceus to one side, alerting first responders to your medical information. 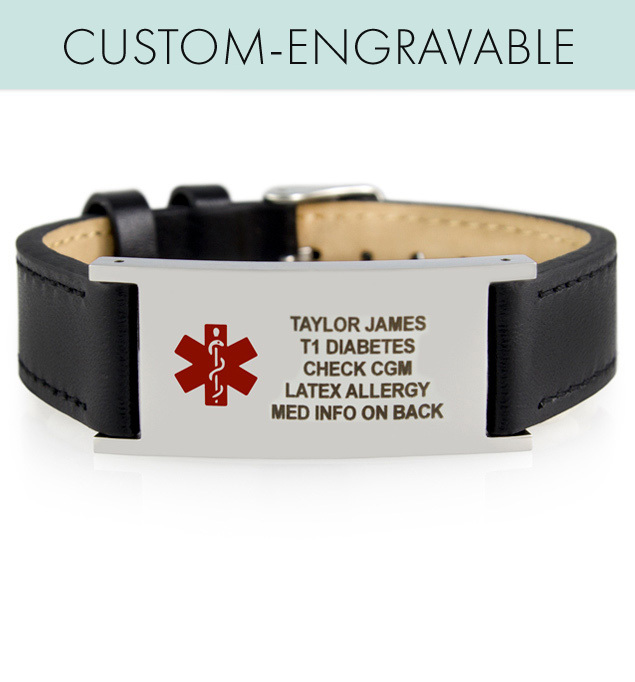 The rest of the front is custom engravable, giving you the best of both tech IDs and custom medical alert jewelry all in one. The front is a great place to engrave immediate, urgent pieces of information, while still using the online health profile for extended histories, med lists, insurance information, and more. A blend of modern and traditional, your Hudson Tech Med ID is as comfortable as your favorite watch, making it a great option for those who don’t usually wear bracelets or who want the flexibility of being able to wear their ID a bit looser or tighter depending on the day. Engravable tech med IDs are particularly convenient for people with complex medical histories, changing diagnoses or contact numbers, frequently changing medications, or long lists of medications and/or allergies. This tech med ID is a terrific option, whether you wear your medical alert for lymphedema, hyperthyroidism, diabetes, a stinging insect allergy, steroid use, or any other medical condition or treatment consideration.